BCA is well known for producing high-quality networking events. When members attend a BCA event, they will be seeing people from the local industry, people they do business with on a day-to-day basis...and also those that they would like to be doing business with. 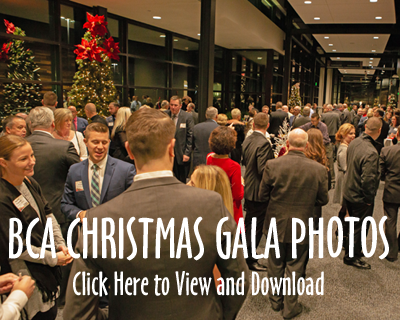 The Annual Golf Outing and Christmas Gala are sellout events each year with 250+ participants. The annual Spring and Fall Membership events entertain and inform, bringing an average of 175 members together for an evening of networking and socializing with their industry peers and associates. Workshops and seminars held on a variety of construction and general business topics. Offered Quarterly | Complimentary luncheon and workshop for contractor members’ safety staff featuring timely and informative presentations on a variety of safety and OSHA compliance topics. Education and networking programs for BCA YPF members held September through May. Helps foster growth in members’ younger employees to expedite advancement in their careers and into positions of leadership. To enroll in YPF click here. Workshops and training offered on a variety of construction safety topics, including First Aid and CPR, OSHA 10-Hour and 30-Hour Courses for Construction. Held periodically throughout the year allowing members the opportunity to interact and hear from Fort Wayne and Allen County elected officials. BCA serves as the official show partner of the Midwest’s largest construction trade show held in February at the Memorial Coliseum attracting over 2500 attendees. The Expo Bash is a member-only event held the first evening. Held in March | Provides an update and overview on regional economic development activities. Held in April | Awards banquet featuring presentations of the BCA Excellence in Construction Awards and the Safety Excellence Awards. Held in June | Very popular golf outing that attracts a sell-out each year. Selected Friday in September | 100% of the proceeds from this unique event is directed to the BCA Scholarship Fund to cover college tuition for local students of construction. Held in September | Our traditional annual membership event with mixer format, dinner, and special program. Held in October | Provides an update and overview on Indiana’s (statewide) economic development activities. First Thursday in December | One of our most popular events with 300+ members in celebration of the holiday.